MTU ONSITE ENERGY GENERATOR SETS COME STANDARD WITH AN ELECTRONIC ISOCHRONOUS GOVERNOR. Governors control the speed, or frequency in Hz, of the power output by sensing the speed of the engine and controlling the amount of fuel and air required to maintain the horsepower required to turn the crankshaft and generator at a constant RPM. Typically, most diesel generator sets in the US generate electricity at 60 Hz and require a constant 1,800 RPM engine speed to provide clean electric power. Electronic isochronous governors use speed sensing and microprocessors to control the engine speed in applications from simple speed control in a single genset operation to load sharing of multiple generator sets in parallel applications. The ECU is an electronic engine control unit that is responsible for the monitoring and control of all engine functions. 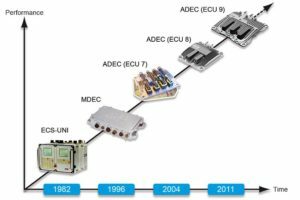 MTU has named the current generation, the ECU 9, ADEC: Advanced Diesel Engine Control. Most modern engines have an electronic engine control system that governs the engine speed and controls the fuel injection system. with electronic conversion kits and replacement parts.